Assuming the scratch wasn't something too serious, does Tommy Edman have any chance of breaking camp with the big club? Or would they prefer him playing every day in the minors? He's set to play every day at a variety of positions for Class AAA Memphis. Has Molina said much about the health of his knee since he’s starting catching in games again? Asked him about this a couple days ago, and he was talking about how good he felt at the plate, not behind it. He wouldn't elaborate, but he was talking about how he had to adjust somethings at the plate because he wasn't comfortable, couldn't put so much weight/force on his knee when swinging, and that he feels more like himself. He used the term "balanced." He's had favorable recovery from his work at catcher, too. I’m curious with carp hurt why not have Bader or fowler lead off? I think today this was to get Munoz more at-bats. He missed some time with that bruised hand, so they are trying to get him some at-bats. I’m not trying to open any can or worms here but if Carp misses time with an injury or for whatever reason they decide to bat him 2nd, who’s the next best option at leadoff? Probably would see Wong or Bader there, depending on the handedness of the pitcher. I suppose Fowler goes off on a scorching April, then he'd make the decision for the Cardinals and move up there. The last time the Cards traded for one year of a free-agent-to-be, there were concerns about what the team would look like in the coming years (an aging core it was said) so he chose the younger team. Considering there's a lot of uncertainty about what this roster will look like in 2020, much less 3-4 years from now, could that hurt the Cards chances of extending Goldschmidt? I see you point. I assume you're talking about Heyward. There was much more to it then the talent coming up. Heyward may have said that, but in some ways that was what he was supposed to say. He wanted to be a Cub. He found that more exciting than being a Cardinal. He thought that was a better clubhouse, a better team right away, a better situation, a cool story to chase, and he was right. He won a championship there and was part of a special team that will never be forgotten in baseball on the north side. Good call on his part. But when pressed about that comment about the young players, he relented to the fact that the Cardinals had rising talent on pitching but not the position players like Bryant and Baez. I think we all agree with him. Goldschmidt is getting a first-hand look at the pitching that is not on the horizon. It has has arrived. DeJong is set. So the team looks different to him at this point than it did to Heyward, and the decision really seems to come down to what the Cardinals offer (it must be market fair) and whether he wants to go elsewhere for whatever reasons, personal, family, or longevity. Has MLB gotten any closer to deciding roster composition with regards to max number of pitchers on the 25-man? Do you think the debate is between keeping 11/12 or 12/13 pitchers? That's been bandied about. Hard to see how front offices would agree to this. Also, I don't know the motivation for players to reduce/limit the jobs of other players. would you expect Jose Martinez to start one game a week or more? Would you expect O'Neill to start less than Martinez? That seems fair. Could see O'Neill starting more often than Martinez at this point, as the roster is currently constituted and playing time has been measured out. I don't know anything how teams can go with a 6-man rotation. Can you explain that to me, and if there's a chance that both Hudson and Gant could end up in the starting rotation? The Cardinals are not planning a six-man rotation. Shildt said that, definitively without equivocation, when asked this week. A six-man rotation would work just like a five-man rotation only they would have more days between starts. It would get complicated if the Cardinals piggybacked one of the rotation spots. Then it gets wonky, and they would have two pitchers in one day, and those pitchers would be available out of the bullpen on the mid-day between starts. Wouldn't the rule where you have to designate a player either a pitcher or position player lead you to believe they are going to limit the number of pitchers you can carry? Not really. But I could be proven wrong. I don't see those dots connecting. It's good to see someone, anyone (Toronto) finally take the step towards paying their MiLB guys a decent wage. I spent 3 years working in the Minor Leagues and people have no understanding of what most of those guys go through. If they weren't a bonus baby or weren't lucky enough to come from a family with money, those guys had rough summer. I assume this is a reckoning that every team is going to have to face sooner or later , but do you think this is something the Cardinals might be looking at as well? It would not surprise if they and other teams discuss it. There are a few teams that I know of that would like to do it. Toronto has opened the door. Here's hoping others will follow. Why should we not just view Bader as the next Grichuk/Piscotty that'll be bumped out for the next man up (i.e. ONeill, Arozerena, Carlson, JAG, etc.)? -- His elite defense. That's real. That's an asset. That's something he has as an edge. -- He has the job now, and that's always the best way to keep a job. Have it already. Two part question: was Eaton's slide into Shrock legal? Either way, was it dirty? I saw nothing wrong with it, either way. Thank you for your Q&A Derrick. As much as a pitch count is talked about in MLB circles, why is it so hard to get them on box scores? At Bat used to have it, but no more. For instance, Hudson pitched superb, it appears, for five innings today. How many pitches did he use to get through those five innings? 50, 70, 90? That tell me a lot about how efficient he is becoming. I think that's a spring training thing. That's a stat readily available. In the spring box scores on At Bat last year (or maybe the year before) the pitch counts were wrong because they only counted action pitches. One pitch for an out. Three pitches for a strikeout. Four for a walk. The numbers weren't accurate. At big-league parks in the regular season, they are. Do you know if Mikolas was more focused on tinkering with a pitch than he was on results today? stltoday.comFlaherty says chance to start home opener would be "freaking cool." When the Cards were exploring a Taylor Rogers trade, did they find the cost too high or the Twins simply wanting to hang on to their big lefty? Good question. So, at the GM meetings -- I believe that was when -- they did look into his availability, and I was told it went nowhere. I may have been told that at the winter meetings. The Cardinals looked into trading Jose Martinez for a lefty with a few teams. They talked to the Giants about two lefty relievers, they tried to engage with Cleveland in discussions about a lefty reliever, and at the winter meetings they became convinced no momentum existed for an Andrew Miller deal that they folded back on some conversations with teams about a trade for a lefty. The Twins were a team of interest for the Cardinals, but I was never able to confirm that got any farther along then the Cardinals asking, asking, looking, and the Twins wanting to keep him. If you can recall, can you compare how Reyes has looked this year compared to before his two injuries? Remarkably similar. And that says something. He has more pitches to use in any counts this spring than he did in previous springs. The slider has upside. Jordan Hicks is warming up. Have to relocate the chat here and possibly catch up with Dakota Hudson for an interview. Rick Hummel will have coverage of the current game available shortly on StlToday.com. I will return to the chat shortly from the back field, if I can score a wi-fi single there. Good questions, folks. Hey DG, with Hudson in the rotation and Gant in the pen, doesn’t that make it a Leone or Brebbia to start the season with the team? Not with Cecil now on the IL. There is some room there if the Cardinals want to fill the bullpen at the expense of one bench spot. HAvent heard much lately about Helsley. Is he heathy? And is she slated for the rotation or bullpen in Memphis? He is healthy. He was one of the first cuts of spring training after warming up for a game he never entered in West Palm Beach. 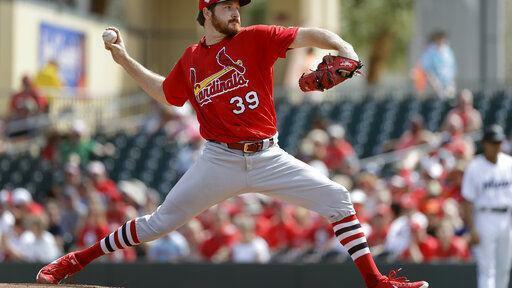 The Cardinals moved him to Memphis in part because they didn't have the innings in the major-league camp and wanted him stretched out for the rotation in the minors, to get that additional work on his pitches, and to get some of the innings that he lacked because of injury this past season year. He and Woodford will be part of the rotation in Memphis, at last check. apologies if this has already been asked, but is there right for skepticism and even concern Carpenter will start the season on the Injured List? This is a recurring injury (or chain of injuries that all tie together) going back to at least 2016. It is premature to be that concerned. Carpenter moving around better today after being limited Sunday. He's had this in the past, and that does raise some caution flags. It's just as likely that he recognized the trouble early because of his experience and moved away from anything that would cause more trouble. That happened earlier this spring with an oblique injury. Pena's is an example of that. Know the indicator, stop, and avoid the aggravation. Carpenter had some days off coming before the start of the season, so if he gets in the games this weekend, sees action Thursday possibly, and this weekend then Memphis, he's set. Any updates on the Edman scratch?